His scepter is golden and his eyes are blue but the rest of this King Nutcracker is the natural wood colors with variety displayed by using different types of wood. 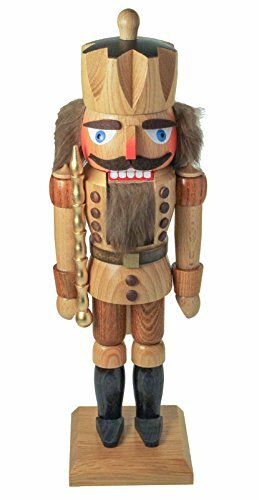 This Natural Wood King German Nutcracker stands over 12 inches tall and was handcrafted in the woodshops in the Erzgebirge Mountains in Germany in the village where the Wooden Nutcracker originated. Start your German Nutcracker collection today and you will have family heirlooms to pass on to your childrens children.